Vous serez surpris par cela, tranquille, 3800 bungalow pieds carrés de luxe situé à pied privé de Kierland Commons (shopping et restaurants), et le Kierland Golf Course. Juste rénové, la maison dispose de haut de gamme finitions contemporaines, appareils en acier inoxydable modernes, et le mobilier contemporain italien. La piscine privée est une oasis de jardin massif avec grill gastronomique barbecue, grande table de patio 6 personnes, fauteuils confortables, et couvert doté d'un patio. Piscine peut être chauffée pour 25 $ / jour. Toutes les chambres principales disposent d'écran plat TV, les quatre chambres ont des matelas moelleux et 500 fil de la literie de comptage. Il y a un service Internet Wi-Fi, une salle de théâtre privé entièrement équipée avec un bureau et l'ordinateur. La chambre familiale dispose d'une télévision et d'une table de billard de 60 pouces. Tout le confort moderne au bout de vos doigts. Situé à 20 min (18 miles) de l'aéroport, au cœur du quartier branché de North Scottsdale. Juste arriver et profiter ..
5 minutes de manifestations annuelles, y compris: FBR / Phoenix Open, Barret-Jackson Auto Auction. Courte distance en voiture de Salt River Spring Training Complex et Fiesta Bowl. Locaux de golf de classe mondiale à des cours comprenant: Westin Kierland GC, Fairmont princesse TPC Scottsdale GC, JW Marriot Wildfire GC, Camelback Country Club, Hyatt Gainey Ranch GC, GC Troon North, The Boulders GC. spas locaux de classe mondiale, des restaurants et des boutiques, y compris Kierland Commons, DC Ranch Market Street, Le Borgata, Desert Ridge Marketplace, vieille ville de Scottsdale, et bien plus encore. entraînement de printemps Major League Baseball, Westworld, sentiers pédestres / VTT, pistes cyclables, désert excursions en jeep, ballons à air chaud promenades, sports professionnels, y compris les Suns de Phoenix, les Coyotes de Phoenix, Arizona Diamondbacks, Arizona Cardinals. Herberger Theatre, Dodge Theatre. Greasewood Flats, Pinnacle Peak Patio. Mots-clés: golf, le shopping, Kierland, Scottsdale, Barrett, énorme, de plain-pied, Quatre, piscine, cour, BBQ, Scottsdale trimestre, pistes cyclables, terrain de sport, la vieille ville, Casino, Entraînement de printemps. We had a great week staying here. The location could not be better and the kids loved the pool and movie room. The place was a bit dirty when we arrived, we did text Blair letting him know and he responded right away offering to send the cleaning crew back over. We declined and wiped down floors and bath rooms on our own. All in all a great place and I would recommend it. We pride ourselves on how clean we keep the property, if you read our reviews, you will see that our guests usually rave about our cleaning staff. Not sure what the issue was in this instance, but yes, I did offer to send our cleaning staff back right away, but he guests declined the offer. I can be reached by text at any time during a guests stay, and we react right away to any issues that a guest might have. Comfortable, Lots of Room in Good Location, Responsive Service! Our family of 7 (2 parents, 3 grandparents, & 16 & 11 year old kids) enjoyed our stay here. The home has lots of room inside and out, and we never felt cramped. Everyone had their own bed (yea, no sofabeds!). Beds, pillows, & bedding were all very comfortable. Enjoyed having 2 kings as well as the bunkbeds. The showers had good water pressure and hot water. The master is huge, with large closet & bath - very nice. Everything was updated nicely with large TVs, granite, and new tile. Furniture was very comfortable, and everyone especially enjoyed the extra large circular chairs. LOVED the large dining table so everyone could sit down for a meal together or to play games. Kitchen was well-stocked with plenty of cooking items (pans, utensils, glasses, etc.). We only used the pool once, and it was fine. Kids enjoyed the pool slide, basketball, and bocce ball games (thanks for having a decent basketball at the house!). It was a tad inconvenient to cover & uncover the pool for use, but we totally understand keeping in the heat. We watched a movie one night, and everyone had a comfortable seat and could all see the TV well. We didn't use the theater, pool table, or outdoor grill, but they all looked nice. We washed clothes a few times, so having a laundry room was convenient. The layout was the only minor complaint as the bath with the laundry is away from the bedrooms, so our kids & 1 grandparent had further to go during the night (other set of grandparents had their own bath next to bedroom). Not a huge deal, just an observation, but it can't be changed. Everything was clean and in working order. We did have to get a shower fixed while we were there, but it was taken care of the next day, and the house manager checked on us a couple of times to be sure we were happy & didn't need anything which was nice. Text responses to questions were quick. Location was in a subdivision that was very safe and well-kept. Digital lock on door is great -- no need for keys or official check-in. Would definitely recommend this property to other families! Thanks for a lovely stay during spring break! This home is meant for a family gathering. The backyard is a lush, secluded space with a great pool, grill, and basketball court. We enjoyed the home so much that we basically cocooned inside and out for the week with little reason find recreation elsewhere. Big open living and family rooms make large gatherings comfortable. And the bunk bed room was ideal for the grandkids. Wonderful neighborhood with convenient shopping just a few minutes away. The owner maintains the pool temperature so we did not have to waste days while the pool heated up on arrival—this is a big deal that we appreciated. Enjoyed the digital entry and checkin. Would highly recommend the property. We traveled into the area with 10 guys for a baseball tournament and stayed in the house for a week. The property fit our needs and exceeded our expectations. We enjoyed the open floor plan and entertainment systems / devices. Utilities and grill worked as well. Would recommend this house. First of all let me start by saying what a great property this is overall. 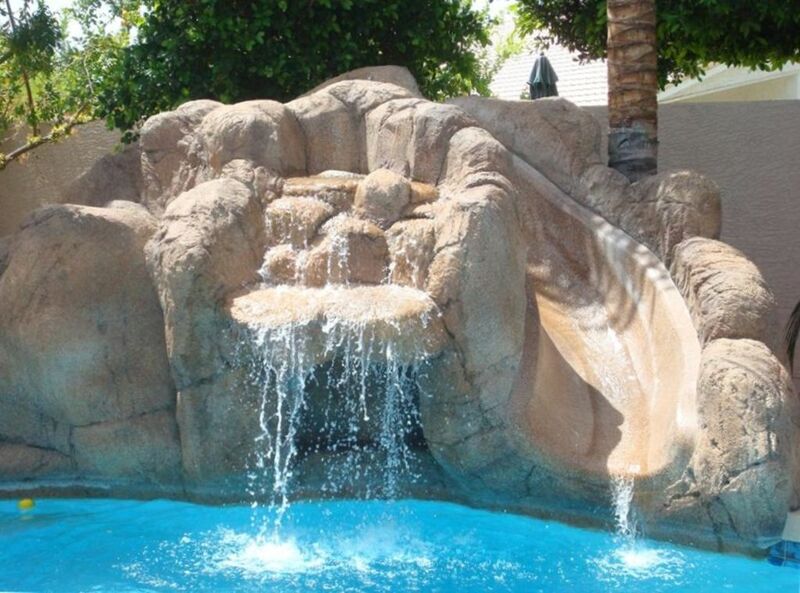 Large, open, modern, comfortable furniture, really nice pool table and theater room, fantastic water slide and pool. We stayed in the this house for 2 full weeks. The location is great.. quick few minute rides via UBER to many local restaurants, shopping, walmart, costco etc. We had 2 families. One with 2 adults, a 17 year old and a 10 year old. The second with a Dad, 10 year old and 8 year old. The house was definitely big enough for us all. Having said all that, there are a few things to consider if you're thinking of booking this place. 1. The pool light does not work. It has never worked according to the owner. We visited end of July beginning of August which are the hottest months of the year so evenings are actually very popular times to be outside as it cools down. However, there is just one flood light and there just is not enough light around the pool. Plus if you're into your evening / night photography then you'll be dissapointed with the pool shots. It would have been good to know this when we were booking. 2. The thermostats are not adjustable. One side of the house is kept at 74 and the other at 73 degrees. For all of us the evenings became just too cold in the house. It would have been good to know this when we were booking. 3. The house alarm is not allowed to be used. If you have expensive electronics or just want some added peace of mind when you're asleep then this is not the place for you. 4. These last two things are fixable and I hope the owner does get them fixed. First, the 3rd shower (in the laundry room) is un-usable. When wanting hot water it trickles and just is not enough for anyone to take a shower. The 7 of us ended up sharing two showers. Might be worth questioning before you book. The second is the laundry washing machine. At night it runs water.. so much so that it wakes you up! I would confirm these issues have been rectified before you book this property. We always appreciate feedback from our guests, and although we try to be 100% all of the time, there can be issues that come up. For this reason we have a full time property manager that lives just minutes from the property, and I give every guest my private cell number, and I am available 24hrs a day. Usually like in this case, the problem stems from the guest not letting us know about an issue that could have easily been rectified, if we don't know, we cannot fix it during the guests stay. Some services we do not offer. We did have an alarm system installed when we bought the house 10 years ago, but with guests setting off multiple false alarms, having the police come out, and getting multiple fines, we decided it was not worth the hassle. Not to mention that Kierland is one of the safest communities in the US, literally zero crime, and we have never had one issue. People literally do not lock their front doors here. These facts were communicated to this guest, but they still tried to use the system, which is not currently monitored, so I had to have a technician come out and reprogram the monitor after they touched it. It is true that we do not have a light inside the pool, but we have multiple flood lights that light up the exterior of the property around the pool for night swimming. Never an issue before. The HVAC A/C system in the house is set to 74 degrees, as we have found that most guest find it a comfortable setting. Had we known that there was an issue, our manager could have adjusted it. If we leave guests free access to the control system, there are always issues. If the A/C is turned down too low, which is usually the case, the lines freeze off and the system seizes up, that is why we have it pre-programmed. We did install a new washer/dryer, but there is also a water softener beside them, that is what the guest was hearing operate. The washer does not run water unless there is a load of laundry being washed. As for the 3rd shower, that is a mystery to me, as guests both before and after this reservation had no issues at all using the shower? Again, with a simple text or phone call, the issue could have been resolved by our manager. I make myself available for communication 24 hrs a day for our guests, and our manager is always just minutes away. There should never be a reason for our guests to have an issue that would compromise their stay with us, but we need the communication in order to make it right. There may be added fees for long weekends and special event weekends like Barrett Jackson, TCP Golf Tournament and Spring Training. 10% fee of the rate quoted will be withheld for cancellation, 60 days notice required to cancel. Less than 60 days notice, there will be no refund unless the house is re-rented at the same rate. Thank you.